Online advertising increased 27% in 2008 according to IDC. Online ad spending has reached 25.5 billion. Is your ad budget reflecting this strategic, long term shift? Contact us today to find out how to take advantage of this exciting new venue for marketing your business. Are you looking to reach consumers and businesses in the Spring area? Drawing upon 12 years of online marketing and sales experience, Bayou City Media Group Inc can show you how to successfully market your products and services on Spring Today to the community. And, with the feedback from your efforts, we can help you get even better results. Americans spend more time per week on the Internet than watching TV. The purchasing decisions of Web surfing Americans are influenced more by the Internet than any other media except television. The steady growth of Web advertising is because it works. Internet ad spending topped 21 billion dollars last year. 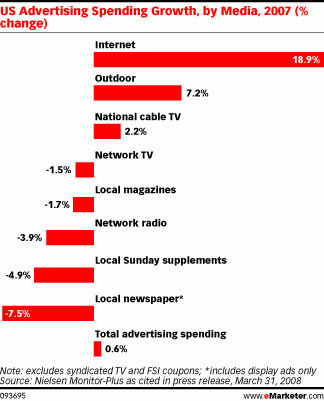 Local online ad spending is expected to double in 2008. Whether you want to build brand awareness, increase foot traffic to your place of business, bring people to your website, or sell online, Spring Today will allow you to capitalize on the area's premier information resource. Maximize your marketing and advertising ROI on the premier community portal for the Spring Texas. Contact us today for more information.